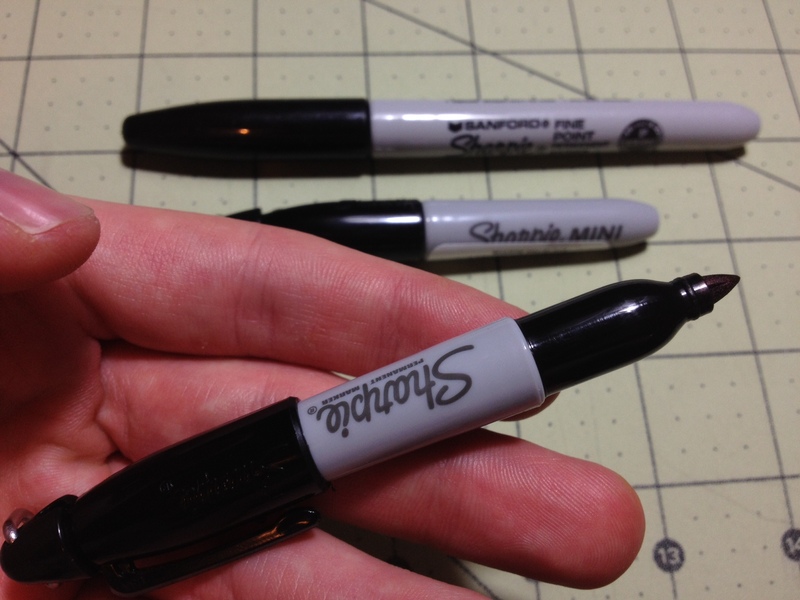 I have reviewed the Sharpie pen before. And the ink in that pen was a bit of a muted black. 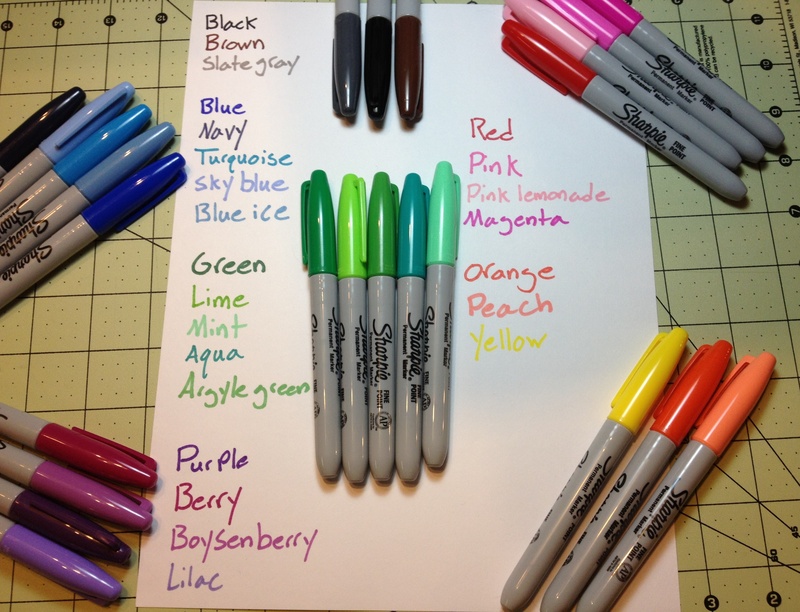 Now it’s time to look at some more of the Sharpie pen color palette: the blue, red, green, purple, and orange pens. Starting off with the blue, which is a typical blue, if a bit washed-out looking. It is a subdued blue that would be appropriate in most work environments. They say that all of the colors are water-proof and smear resistant. I will say that is mostly true unless under extreme circumstances, but don’t expect them to be as all-around useful as their marker cousins. They also dry fairly fast and are supposed to be non-toxic, but I’m not checking that. Now to the red, which is the most disappointing of the bunch. It is faded and looks almost pinkish. It’s hard to tell it’s really a red and it certainly lacks the intensity most look for in a red ink. That being said, it is subdued and will work better in a work or school environment where one would want a less aggressive color. The green is, say it with me, subdued. It is undeniably green, and being as laid back as it is almost intensifies it. It’s the hardest to read out of the bunch and is almost eye hurting after a while. Strangely it is almost identical to Micron green. The purple is flat, but deep. It is easily the darkest and most readable of the bunch. 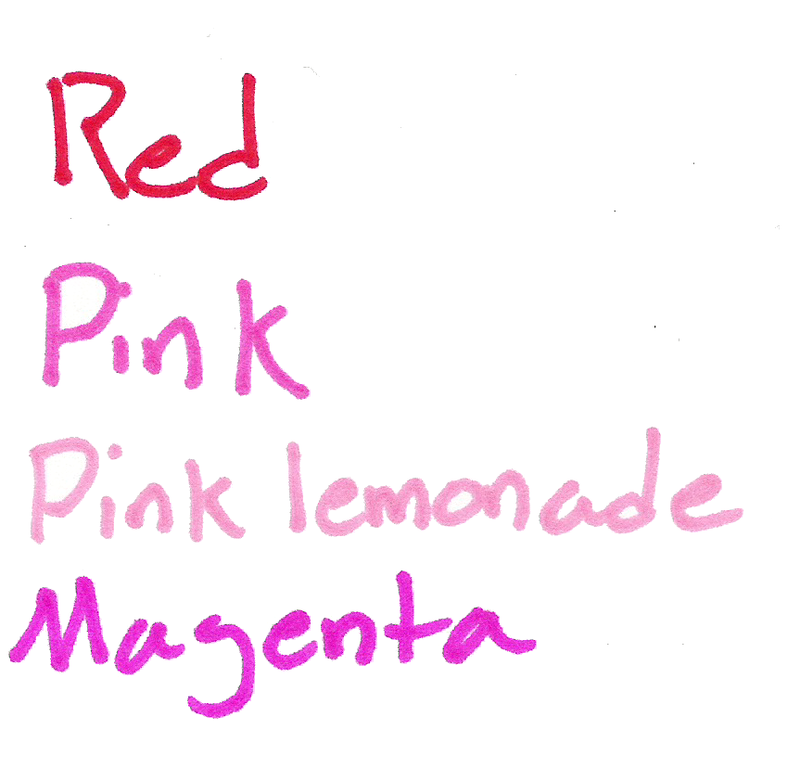 It is also fairly close to a Micron purple and provides a nice, neutral color, that is still quite different. Now finally the orange. 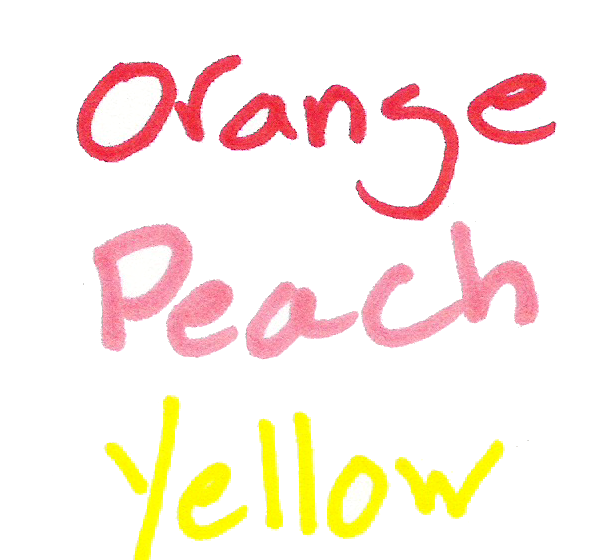 The orange is the only intense color out of the bunch, and even then for orange it is fairly flat. It does jump off the page and provide the kick one would expect from a nice orange. I’d say it’s probably the best color of the bunch. So there are a few colors. Aside from looking almost identical to Micron colors I’d say they’re good. I haven’t the foggiest as to why that is but it is a bonus in my book. Anyway, if you like Sharpie pens, and want some nice, pleasant colors for work or some such, I’d take a closer look at these. And due to their subtlety they also look much more natural in drawings than standard, intense colors. So you want to ink a drawing you did, but you can’t find Microns, or any other technical pen. You certainly don’t want to use a ballpoint. What do you do? Well, the Sharpie retractable pen may be an answer. The black version, to be precise. 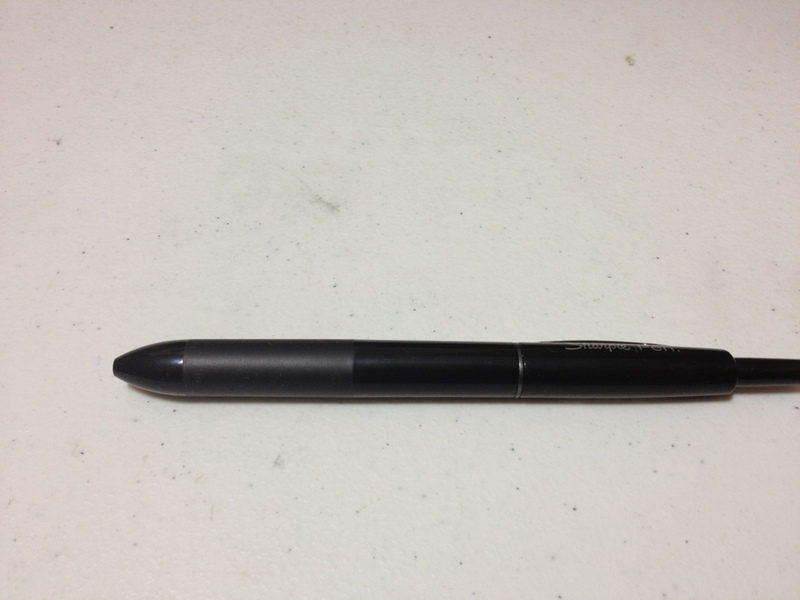 The pen itself is a shiny black that gets finger prints on it constantly, though it cleans easily. The body of the pen starts out wide and tapers toward the rear of the pen. Near the front is a rubberized grip section with some grippiness to it. 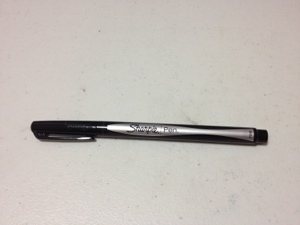 Sharpie pen is written on the back near the clip in silver. 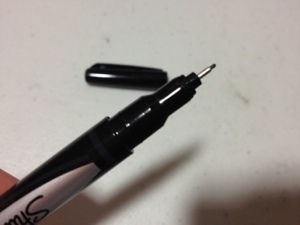 The pen looks like it can be taken apart in several places, but it can’t. The clip is metal, it’s rather stiff and doesn’t easily go into or out of a shirt pocket. 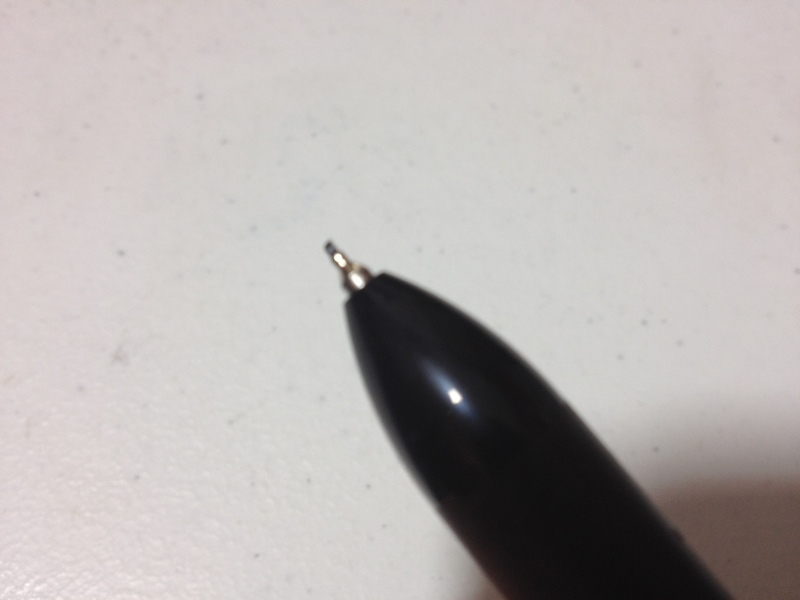 The click mechanism in the back for retracting the pen feels solid, but the plunger is loose and feels a little flimsy. As for the most important part: the tip. 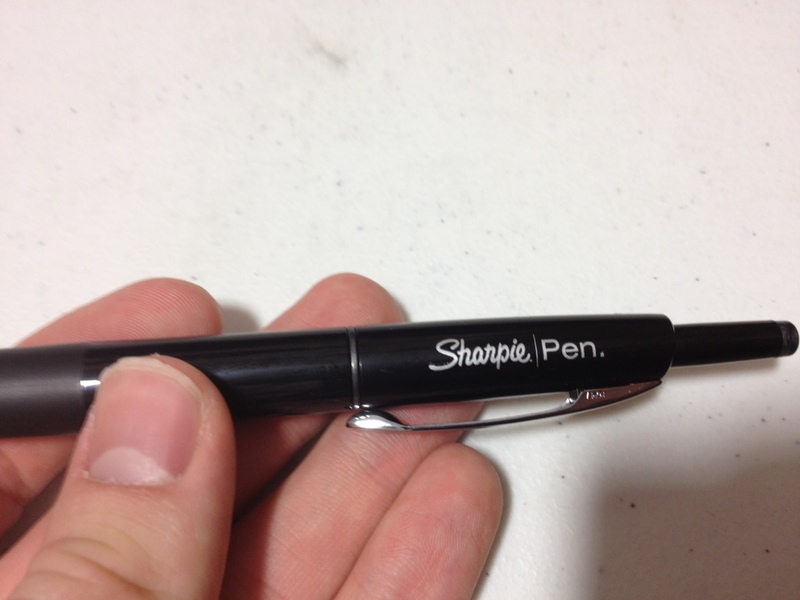 It’s a fine tip, with the standard very black Sharpie color. It puts down a fairly smooth line. I would compare it to a Micron 01 or that range, but it’s really slightly smaller. The tipping material is very stiff and doesn’t like to bend, which leads to less line variation but a longer usable life. It’s not a permanent pen, or at least permanent like the markers. It writes and sticks on most surfaces, but not on all, but it is very black on everything. Overall is it going to replace a good technical pen? No, but it is very good for inking in a pinch or if you want a less-used line width in your art. It writes well, it looks good. The main problems for me stem from the fatness of the pen and the cheap-feeling mechanisms. Is it for you? Maybe. I’d recommend trying it out and maybe keeping a few around just in case.